Integrated electronics piezoelectric (IEPE) accelerometers are a mainstay of the industrial vibration monitoring market. Accelerometer devices use the force generated by moving a seismic mass to measure the acceleration of the mass. These rugged devices are found in a variety of industries for field vibration testing, especially in the area of low frequency vibration measurements. IEPE are commonly used for the advantages of wide dynamic range, wide frequency response, high sensitivity, wide operating temperature range, and low output impedance. However, these devices are not without their limitations and can be susceptible to the effects of transients and noise. The explosion of the wind turbine market has made them the sensor of choice for monitoring these massive, slow speed equipment. 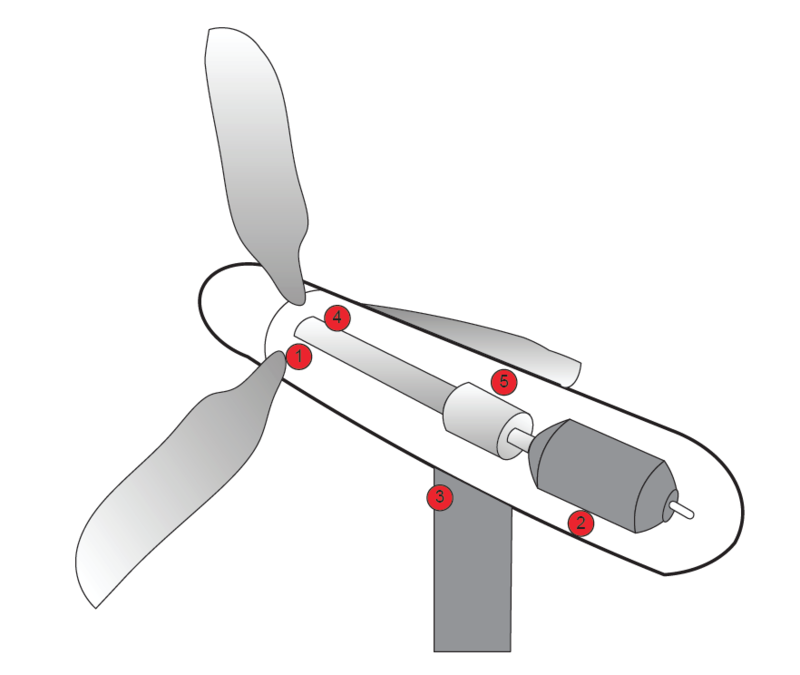 Effective wind turbine monitoring is performed in the nacelle with sensors located at five key locations. ISO 10816 standards for condition monitoring of onshore wind turbines (Part 21) identifies these locations as shown in Figure 1. Integrated electronics piezoelectric (IEPE) accelerometers feature an internal amplifier which converts the highoutput impedance charge signal from the sensing crystals into a low-impedance voltage output signal for analysis. This standardized design is compatible with most hand held data collectors and FFT analyzers. Figure 2 illustrates the basic configuration of a shear design IEPE accelerometer. 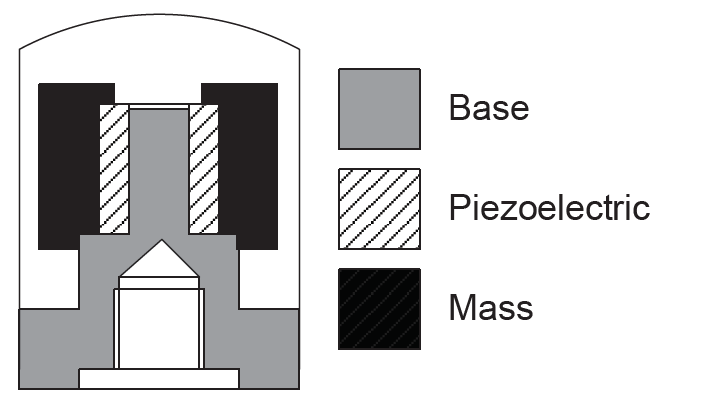 The base, piezoelectric crystal and mass is the core of the sensing structure. The printed circuit board with the amplifier circuit sits on top of the mass completing the sensor pellet. A faraday shield is attached around the core to limit the influence of radio frequency (RF) signals. The pellet assembly is inserted into the accelerometer body with the only attachment point being the base. An isolation material is used between the base of the accelerometer and the pellet assembly, providing from 100 – 500 volts of protection. For most applications the isolation is sufficient enough to protect the sensor in industrial environments. The figure below shows the electrical characteristics of sensor body and internal electronics. When lightning strikes wind turbines, several thousand volts of electricity are injected into the tower for a short period. If not properly protected catastrophic failures can result. Even when measures are in place, several thousand volts of short term transient energy can be present inside the nacelle constantly searching for a path to ground. If an accelerometer is within that path it can be fatally destroyed. 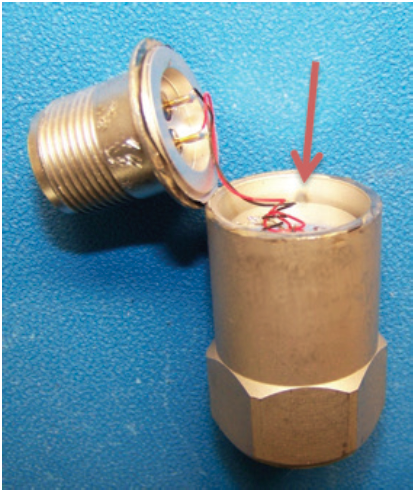 The photo below is an accelerometer from a wind tower that sustained a lightning strike. Notice the small black mark indicative of the location where the energy jumped from the case of the accelerometer into the active IEPE circuit. 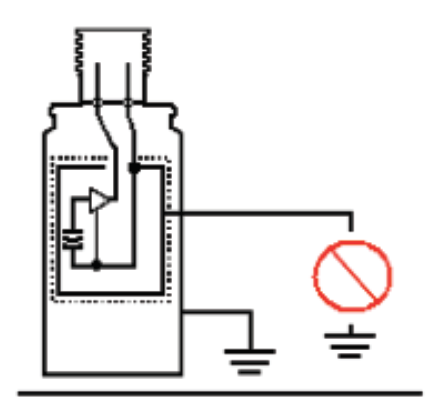 Permanent damage to the IEPE circuit can be seen. To better understand what happens in cases of lightning strikes, a study was conducted to investigate what types of electromagnetic interference (EMI) caused failures in typical IEPE sensors. Various tests were performed conforming to International Electrotechnical Commission (IEC) 61000 conditions of achieving electromagnetic compatibility. The purpose of the tests was to identify typical sensor resistance to electrical fast transients up to 4 kV and surge immunity tests up to 6 kV. Several EFT burst immunity test were performed. For this test, energy was capacitively coupled directly to the shield and signal lines in separate test. When surge energy was applied to the shield, grounded or floating, no damage resulted. When surge energy was applied to both signal lines A and B simultaneously no damage occurred. When surge energy was applied to either the A or B signal line separately, the sensor sustained catastrophic failure. For the surge immunity test, energy was coupled to the sensor cable shield, both grounded and ungrounded. Under this configuration, no damage was sustained to the accelerometer. Then surge energy was applied to the accelerometer signal lines A and B. For this test, visible damage occurred to the printed circuit board assembly. 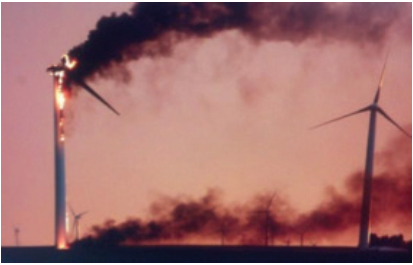 This failure mode was not consistent with the failures seen in wind turbine applications. As a result of these tests, an engineering study commenced to design a new sensor body that would eliminate failures due to fast transients being presents in wind turbine nacelles. Preliminary testing of a new prototype design has shown promising results in being able to withstand surge voltages as high as 6 kV. Many IEPE accelerometers have excellent noise specifications, but if the signal conditioner/data acquisition system cannot take advantage of this capability, this high performance can be degraded. Carefully consider the noise performance of the data acquisition system to ensure it does not degrade the quality of the measurements being taken by the accelerometer. Some lower cost signal conditioner/data acquisition systems may especially have a problem in this area. Inherent in the way the IEPE powering scheme works, any noise originating from the voltage supply for the constant current regulator will directly couple into the accelerometer’s output signal. Frequently, the voltage supply used on these lower cost systems is derived from simple switching DC-to-DC converters, which typically are noisy. In addition to the inherent noise of the data acquisition system, when properly powered, an accelerometer will output a DC bias voltage, as well as the dynamic AC signal proportional to acceleration. This is inherent in the IEPE powering scheme. This DC bias must be filtered out within the signal conditioner/data acquisition system in order for the dynamic signal to be further processed. This is typically done with an RC network, thus setting the low frequency response of the system. The accelerometer may be specified down to a very low frequency, but if the data acquisition system isn’t specified to the same (or better) level, it will degrade that performance. Taking these considerations into account, the ScopeCorder DL850E was designed with built-in antialiasing filters to accept inputs from wide bandwidth, high voltage accelerometers. 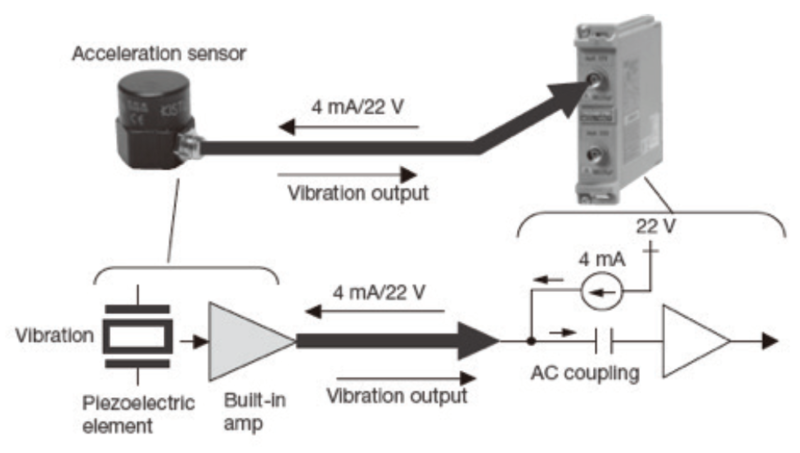 The 701275 acceleration module supports direct input of IEPE accelerometers, thus eliminating the need for charge amplifiers as shown in Figure 4. This also has the added benefit of providing low impedance inputs for excellent noise eliminating characteristics. Correctly managing these factors will help the user avoid erroneous data from their IEPE accelerometer and ensure the quality of the measurement data is at the level they expect and require. Ensure the signal conditioner/DAQ system supplies adequate constant current to properly power the accelerometer. Ensure the signal conditioner/DAQ system meets the proper compliance voltage requirement of the accelerometer. 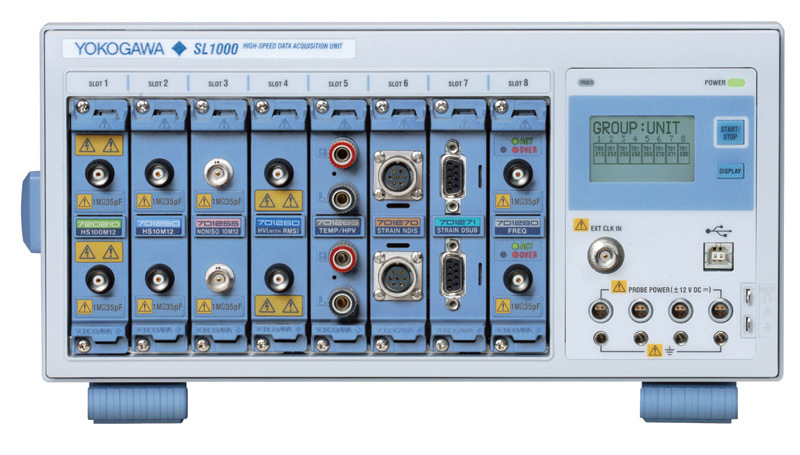 Consider the noise performance of the signal conditioner/DAQ system. Many lower cost systems can significantly degrade the noise performance of the accelerometer. Consider the high frequency response of the measurement system. In particular, ensure the signal conditioner/DAQ system can supply adequate current when using long cables, or measuring high amplitude and/or high frequency accelerations. Consider the low frequency response of the signal conditioner/DAQ system.